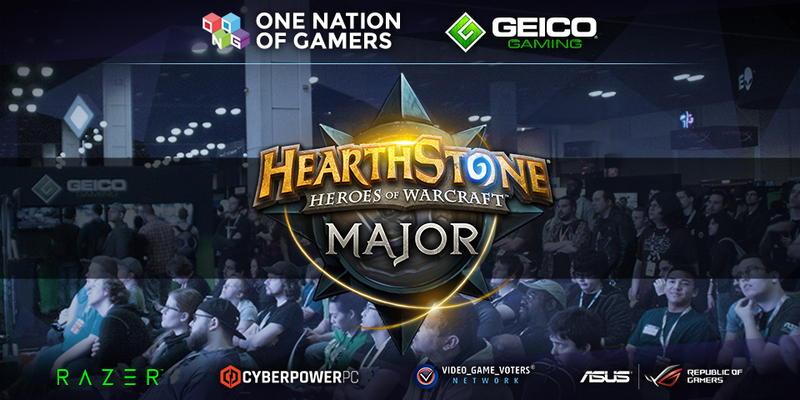 This past weekend OneNationOfGamers hosted a huge Hearthstone tournament featuring some of the best players in North America. 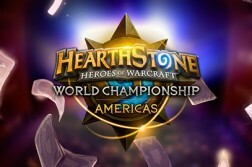 With sponsors including Gieco, Cyberpower PC, Razer, and ASUS the tournament will boast a total cash prize pool of $10,000 and 43 Hearthstone World Championship points. 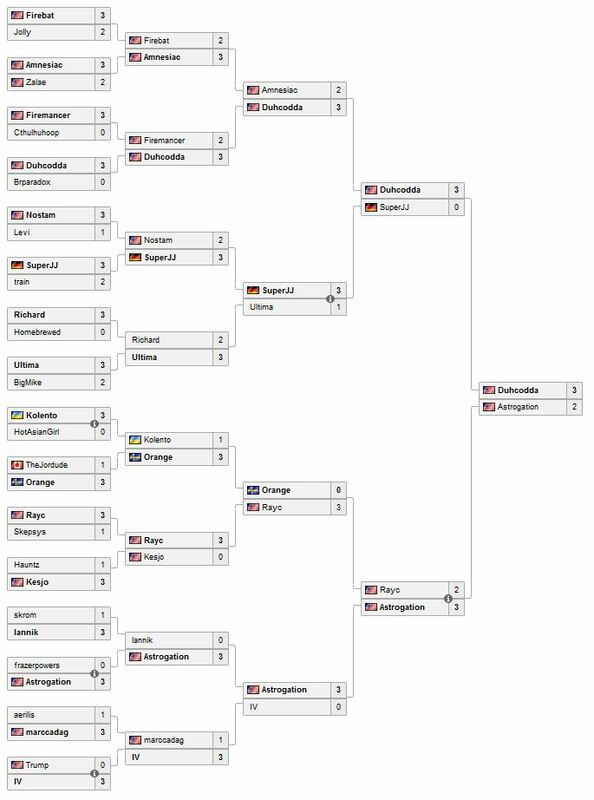 With the dust settled after the grueling 256-player single elimination bracket SuperJJ from Team Complexity, Duhcodda, Rayc, and Astrogation all advanced to make it to the semi-finals. Game 1 of Rayc vs Astrogation featured Rayc on Zoo Warlock against Astrogation’s Patron Warrior. Astrogation drew the removal he needed early game and kept his health just high enough out of reach of Rayc’s Leeroy + Power Overwhelming combo to take the win by turn 9. Game 2 featured a Druid mirror match. Astrogation maintained the early advantage drawing into both of his Wild Growths and kept up the pressure to bring home the victory soon after. This left just his Freeze Mage for triple match point. In Game 3 up against a wall Rayc chose to stick with his Druid to try to burst down Astro’s Freeze Mage and he was successful maintaining the board presence he needed by silencing a Doomsayer and eventually popping both Ice Blocks to bring the series to 2-1. Game 4 hinged on a critical turn 6 where Rayc was able to use Keeper of Uldaman to deal with Astro’s Doomsayer. With Rayc’s Rag on the board Astro was on a timer and opted to start throwing spells into Rayc’s face but it wasn’t enough as Rayc took the win and brought the series to its ultimate game. 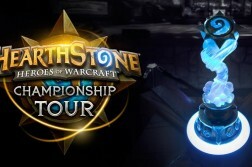 Now with a trip to the finals on the line Ray’s Zoo Warlock faced off against Astrogation’s Freeze Mage. Astro drew a lot of card draw and big minions which left Rayc free to establish a significant board and then protect it with a Loatheb which setup a fantastic Enhance-o-Mechano turn to pop an Ice Block early. However, with a brilliant turn Astro double Ice Lanced his own Mad Scientist to grab his second Ice Block which then allowed him to Offensive Alexstrasza and set up lethal with Pyroblast finally taking the win in a fantastic 5 game set. Meanwhile in the other semi-final matchup Duhcodda handily dispatched SuperJJ 3-0 in a very surprising match. This setup the grand finals between Duhcodda and Astrogation. Game 1 featured a Warlock mirror matchup with Duhcodda on his Reno Warlock and Astrogation on his Zoo. A big 4 damage roll on Imp-plosion brought Duhcodda back from the brink in the early game, but Astrogation came back strong with a Brann+Dr. Boom turn to get 4 boom bots! It wasn’t enough however, as Duhcodda eventually drew his Jaraxxus and ended the game soon after. 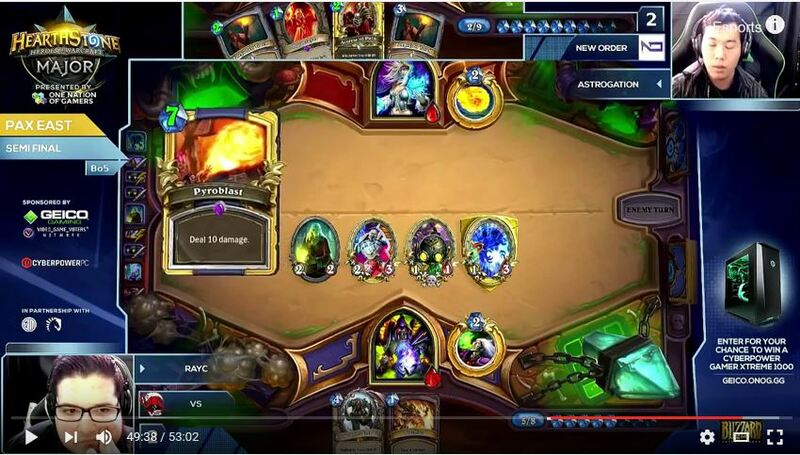 In Game 2 Duhcodda switched to his ramp Druid deck while Astro stayed with his Zoo Warlock deck. Astro maintained early board presence and was able to get both Sea Giants on the board which put enough pressure on Duhcodda and Astro took the win to even up the series. With the series tied at 1 game apiece Duhcodda stuck with his Druid deck while Astro switched to his Warrior. Astro kept dead-drawing while Duhcodda kept clearing the board to deny a good Battle Rage and Astrogation conceded soon after bringing the series to match point for Duhcodda. Game 3 was Duhcodda’s Tempo Mage vs Astrogation’s Warrior. Astro grabbed the early advantage by flooding the board with 6 Grim Patrons by turn 7. Duhcodda didn’t have an efficient answer and Astrogation took the easy win which brought the grand finals to the concluding game 5. In the final game of the tournament Duhcodda’s Tempo Mage faced off against Astrogation’s Freeze Mage. 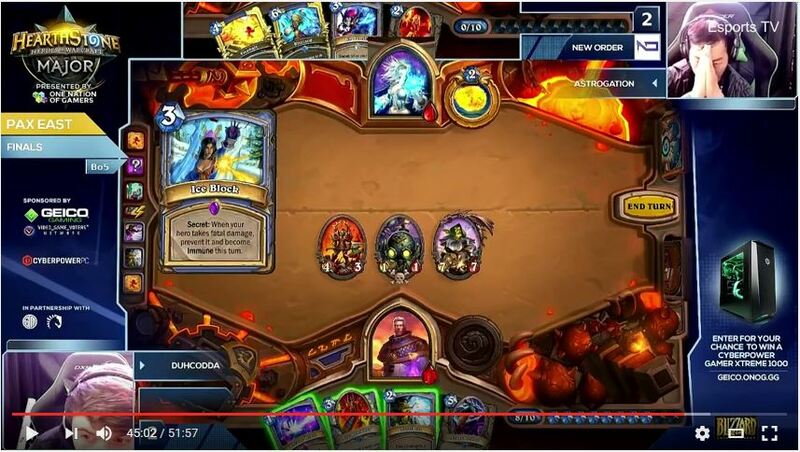 And in true Hearthstone fashion it all came down to the final draw as Astrogation needed a Roaring Torch to finish off Duhcodda but he just drew his Emperor. This meant Duhcodda, an almost unknown, took the victory after an impressive weekend of Hearthstone from him taking down established players such as Amnesiac and SuperJJ on his road to $4,000 and 15 Hearthstone World Championship points!